On Tuesday morning snow came down on the Eastern Coast. Not enough to worry some, but enough to cancel school and work for many. DC was covered in a lovely blanket of white and I was slated to fly in on Tuesday afternoon. I watched the weather carefully all day Monday and Tuesday morning, simultaneously hoping that it wouldn’t snow enough that my flight plans would be disrupted but that it’d snow enough that some would still be on the ground when I got there. (We don’t see a whole lot of snow down here in Georgia). Sure enough, the weather cleared up before I arrived and there was just enough snow for me to show my kids via text and FaceTime and win cool points. Sure, it was half-melted and had gone from fluffy to crunchy but it was SNOW! Another way I get cool points with my kids is to show them pictures from the airport and from my flight. As we were beginning our descent into DC, I noticed our shadow in the clouds – something I’d seen before but knew my kids hadn’t. I quickly opened up my camera and tried to get a shot before we came out of the cloud. It was so fast that it didn’t even really have time to focus, but as soon as I snapped the shot I realized that there wasn’t just a shadow. Around the shadow was a perfect glowing circle. This is a cropped but not edited picture of what I saw. Nothing has been added or altered in this picture. No filters, no editing, no anything. Logic tells me that it was probably something to do with moisture in the air and the sunlight hitting it just right and blah-blah-blah. (Side note: Glory be! I was right). But sometimes logic doesn’t satisfy the soul. I’ve shown this picture to a handful of people, all of whom have called it something different(a circle of protection, the hand of God, a guardian angel) but who meant the same thing: something or someone protecting us on that flight. And though I believed that (logically) there was a reason for it, I’d be lying if I didn’t also feel (emotionally?) that it meant something. Even though I knew darn well there had to be a good explanation, I have to say that a warmth did settle into my chest. Like that feeling you get when a piece of music stirs your heart beyond words. Or the first time your child says “I love you” and you find a little catch in your throat. Or when the sound of someone’s voice stops you in your tracks and makes you turn, with a smiling face and thumping heart. Sometimes reason rules. Sometimes you have to listen to logic. But sometimes? Sometimes you just have to zip your lips, open your mind, and let your heart feel it all. 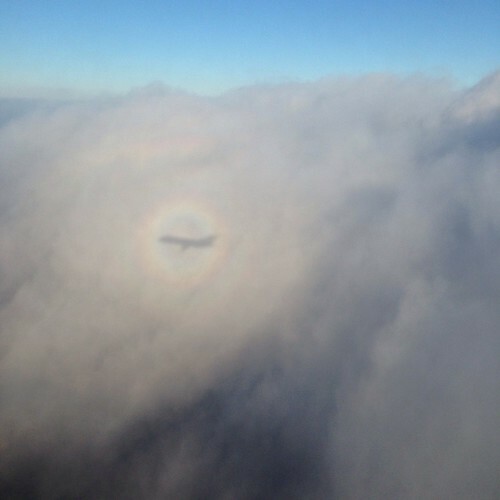 I’ve never even seen a plane shadow in the clouds- doubly cool! Pretty amazing sight! Ditto to Kimberly! and if you fly into Reagan Nat’l you feel like you need extra protection with all that twisting and turning! So beautifully put!! What a sight. I always believe God is watching over us and that His protection is there.